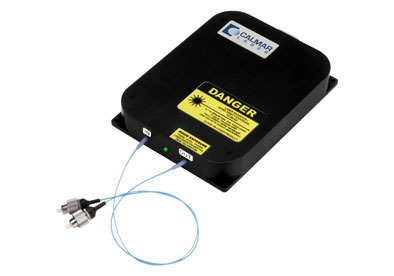 The C-band bench top fiber based femtosecond pulsed laser (FPL) is a passively mode-locked fiber laser that utilizes a saturable absorber to deliver excellent stability and reliability. With up to 20 mW output power, the FPL series is the most economical solution for applications requiring low power. Our Erbium-Doped Fiber Amplifier (AMP or EDFA) bench top is an optical amplifier system using erbium-doped fiber as the gain medium that provides high gain and a low noise figure. Calmar’s unique AMP-LD EDFA is optimized for low dispersion short pulse amplification. It offers exceptional stable and reliable performance with turnkey operation. Along with a portable design, our EDFA provides stable saturated output power up to 40 dBm and noise figure of less than 6 dB. It offers either a polarization-maintaining (PM) or non-PM fiber output. The polarization maintaining EDFA (AMP-PM) ensures the amplified output is linearly polarized and eliminates unwanted polarization effects. An L-band EDFA version is also available. The Coronado AMP-LD can be used to amplify short pulses from the Eureka and Mendocino lasers.